American cans: They're over-red, over-syrupy, and they're over here. But, which one is the Real Thing? The classic taste of America is appearing in Kiwi vending machines – but is it The Real Thing? American Coca-Cola is being parallel-imported and has appeared in one company's Auckland machines, and in several dairies. Vendors turned to the cheaper American version after New Zealand Coke prices went through the $2 a can barrier, without GST. But to the seasoned Coke drinker, the difference in taste is obvious. New Zealand Coke is made with sugar while the American drink has used high-fructose corn syrup since the 1980s, producing a syrupy flavour. According to the cans, the American version has fewer calories than its Kiwi cousin – 140 a can compared to 153, but more salt – 45mg compared to 36mg. In an entirely unscientific Sunday Star-Times taste test, six out of six people preferred the New Zealand version, calling it "stronger" with "finer bubbles", and describing the taste as "richer". The US version was described as "sickly sweet"and "generic". High fructose corn syrup is widely used in America but has been linked to obesity, diabetes, liver and heart disease. One study also found elevated levels of mercury in the syrup, which is made when "enzymatic processing" converts the corn's glucose into fructose. 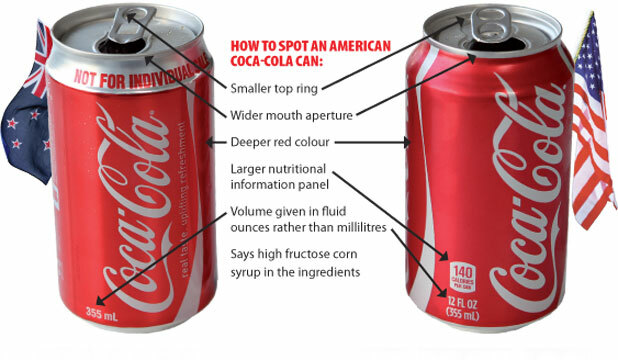 Auckland vending machine company Provender has stocked American Coke in some of its machines. Industry insiders say the change came about when Coca-Cola Amatil New Zealand raised the price per can from about 90c in December to $1.20 early in the year and then to $2.05 plus GST. A wholesaler for the American Coke, who asked not to be identified, confirmed it was being imported by "a bloke in South Auckland", whom he declined to name. A Coca-Cola Amatil spokeswoman said parallel importing was legal. "While we would prefer that suppliers purchased New Zealand products, we can't control how an individual or company chooses to source product." She said machines maintained by the company would stock New Zealand Coke, and the ones stocking the American product would probably be confectionary machines that also dispensed drinks. The spokeswoman recommended buyers check for NZ-made labelling.